Welcome back to our blog. Today we’ll take a look at how enthusiasts decide where to buy their engine components. 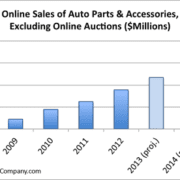 This includes purchasing auto parts in retail stores, or purchasing online. We surveyed thousands of automotive enthusiasts about their shopping habits to find out things like where they go to find information, what magazines they read and websites they visit, how much they spend on parts annually, etc. Today, we’ll give you a look at our findings of what enthusiasts considered most important when deciding where to buy. The choices enthusiasts were given were: product knowledge, return policy, business reputation, ability to install, bought from them before, lowest price, product availability, and customer service. Bought from them before. Enthusiasts tend to return to parts suppliers whom they have bought from before, provided they had good experiences with the business. If the enthusiast’s trusted provider doesn’t have the part in stock, however, don’t expect them to wait around. The enthusiast will move on, as product availability is very important to them. So, if the enthusiast is forced to choose another business to buy from due to lack of availability, a recent bad experience or some other factor, what helps them decide where to go next? Business reputation. Enthusiasts also care if a business is known to provide a good product and experience when making the decision of where to buy from. Enthusiasts get information about businesses from reviews and talk on the internet, word of mouth from friends and other enthusiasts, professional recommendations and through advertising. Product availability. Enthusiasts also rated product availability as one of the most important factors in deciding where to buy. It’s important to enthusiasts to be able to get the part when they need it, so a business that can consistently get them their parts as fast as possible is a big plus. These three factors play a large part in where enthusiasts decide to buy, so keep them in mind when attracting new customers and retaining your current ones. This is also important for auto parts SEO and paid search marketing, so make sure your efforts not only get you found organically, but also watch your online business reputation as well as clearly showing product availability. What other factors do you think come into play when enthusiasts are making a decision of where to buy? Tune in tomorrow for Engine Block Buyers: Amount Spent Annually on Parts and Accessories.